Preferred Kiln Type and Firing Process: wood firing home-made brick kiln. Vancouver Art Gallery: the site links to the Virtual Museum Collection for a variety of museums. Art Gallery of Greater Victoria : a small collection. Searching wll bring up images of pottery, paintings and drawings. Notice the priority of pottery in her listing. It must have been galling to sideline her art for such things. The situation was probably complicated by her personality which was generally accepted as eccentric in the local community. The trigger to produce pottery came from one of her tenants, Kate Mather, who operated a gift shop in Banff. Mather, around 1924, suggested Carr make “Indian Pottery” to sell in her shop. Poverty did not seem a viable option for Carr so her brief five to six year pottery career was launched. Eventually her pottery began to sell in eastern markets also. Ironically her pottery sold well everywhere but Victoria. Her labours typify some of the problems faced by potters in the early part of the 20th century – and it was a struggle. The work she produced was called brown pottery or unglazed work ² What she produced, how she produced it and how she felt about are described in her autobiography “Growing Pains.” She never seemed to enjoy making the pottery, referring to the activity as “prostituting” herself by using west coast first nation designs. By 1930 she was out of any major production. Essentially her work was once-fired earthenware with painted designs. She had worked with clay modelling in her art studies at the Westminster School of Art, London, but did not delve into pottery until World War I finances forced her. 4 She used the blue clay from the local Dallas Road Cliffs or from a construction site, then loaded the clay into her wicker pram to take it home. Since it was raw material she had to sieve, mix and knead the clay with a rolling pin until it was workable. 5 The blue clay was difficult to fire due to shrinkage. Her production consisted of pots, bowls, candlesticks, plates totem poles and plaques.6 Basically her work was hand-built. She does not mention a wheel or any throwing on the wheel. Considering her current reputation and prices at auction it is sad to think that in this period she was in survival mode, making “stupid objects,” and extremely unhappy. Her kiln might have been “crude” but she certainly knew what she was doing in her firings. Where or how did she learn this? Was it the Westminster School of Art, London, where she did some clay modelling; or more locally with the Art Nouveau ideas and pottery classes spreading in the Victoria community? Those details are unclear. During this period Carr was encouraged by visits from Marius Barbeau, the anthropologist and author, and Eric Brown, Director of the National Gallery of Canada. The former helped in sales in Eastern Canada and her inclusion into the 1927 exhibition the National Gallery, “An Exhibition of Canadian West Coast Art, Native and Modern.” So in spite of her feelings about her pottery she was able to produce gallery-worthy works that can be seen in auctions today. This encouragement reflected the nationalistic feelings sweeping the Canadian cultural world. This was, after all the days of the Group of Seven, whom Carr also met. Carr also provides and interesting contrast with the other western artists, Axel Ebring and Peter Rupchan. She was not a rural artist, and she was not an immigrant. Her environment in Victoria enveloped, almost smothered, her in its social and hierarchical values. She fought this all her life. Ironically, although Ebring and Rupchan had to similarly produce or starve, their environment permitted them the freedom to be recognized and valued, and to produce for markets, unhindered by what was considered “good art.” Where Ebring and Rupchan were able to be true to their immigrant-root sources Carr moved into adapting another culture’s imagery, and imagery she thought had more of a right to than others; also, unlike these contemporaries Carr came from an urban milieu and a painter’s apprenticeship. But like them she was not to leave any followers or school. Carr’s work, in some of its finer forms, was quite impressive. The medium of clay was not used in a truly ceramic nature. It is obvious that the perfection and subtlety of her clay forms were not her principal concern; rather they were surfaces for her designs. Many of these designs were quite accomplished in their covering three-dimensional forms, whether they be bowls, dishes or the like. The value of her pottery at auction has been high reflecting the brand-value of a name-artist. She intuitively realized that transferring her painting subjects and styles to ceramics was not a good choice. In a parallel with china painting she made her own blanks and decorated them with paint. The subject matter of her pottery was the Northwest coat native designs, predominantly seen on the “totem poles” and houses she so frequently painted. The images are decorations, divorced from their mythological and clan meanings. She did not appear to have “European” portraits or landscapes on her pottery. Small Small Design Bowl. Small Fish Design, Dallas Road Clay Pot, Signed With Klee Wyck (Emily Carr) Monogram – height 4.45cm, width 5.0, depth 4.45cm . Sold by Kilshaw’s Auctioneers, Victoria BC, February 24, 2011. Her overall forms or shapes and designs vary in quality. Some are simple pinch pots. This little pot is interesting in spite of its showing its age. One can see that she built up its form around a cylinder. This process probably created a weak area that eventually flaked off. She then incised this surface to create her fish design and painted the incised shapes. The interior is interesting because it shows the imprint of her fingers as she moulded the initial cylinder and added shapes. The pot is quite small. She could, therefore, fire many such objects at one time. Painted Dogfish Bowl. Painted ceramic sculpture, circa 1924 ~ 1926, signed Klee Wyck, 14 x 13.3 x 5.1 cm. Heffel Auctioneers. Other works are trimmed slabs built up or seemingly press-moulded over pre-existing shapes. This Dogfish Bowl above is an average size that could easily fit into the palm. Carr has expertly fit the dogfish shape into the concave shape of the bowl. The shapes are simple and flat, although her paint density does give the effect of a colour wash. The concave shape seems to have inspired her designs quite differently from her convex designs on the exterior of pots, beakers and the like. In these latter it is the exterior of the form that receives attention, whereas in the bowls it is the interior that receives the main design. She uses the interior like a bent canvas with energetic lines and shapes. Her colours are her conventional ones but in this bowl she has left parts of the bowl interior untouched by colour. The base of the bowl shows another aspect of her work. The exterior is simply designed with a loose water-like wave pattern in blue continuing the water theme; otherwise, the colour is simply that of the red, fired clay. 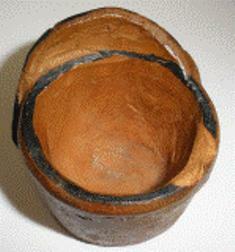 This particular bowl does have a simple carved, ridge base foot. Many of her works do not. 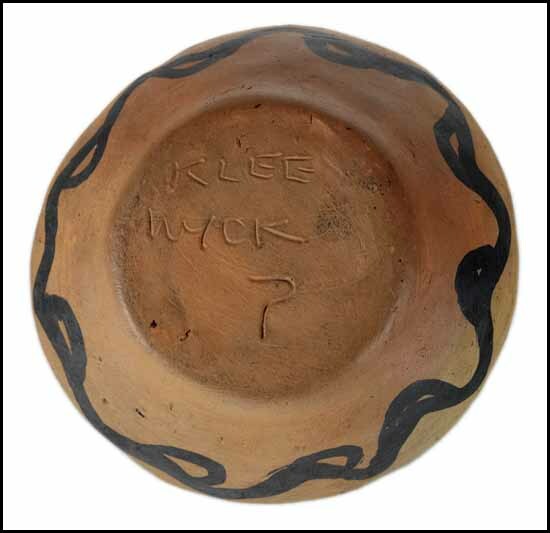 Within the foot are her two signatures, “Klee Wyck” and her “question mark” symbol. Interestingly Heffel Auctioneers describes the work as painted ceramic “sculpture,” rather than as a bowl. This particular view show the bowl was hand-made and not thrown on the wheel. Its slighly out of true profile adds a further “primitive” quality to such work. Like her other pots there is no glaze, either on the interior or exterior. Carr. Klee Wyck Dogfish Bowl: , ceramic sculpture circa 1924 ~ 1926. 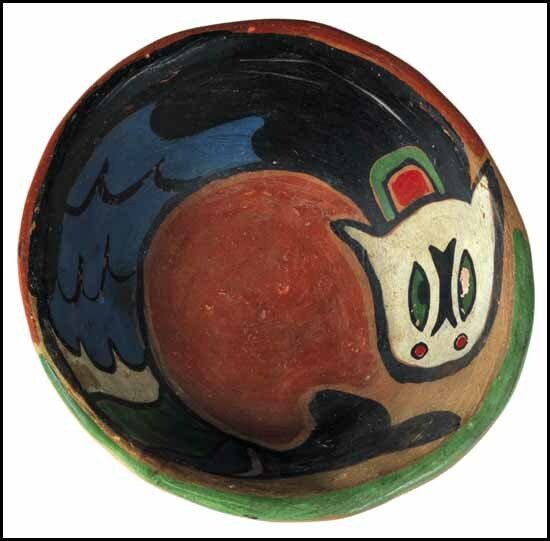 Klee Wyck Dogfish Bowl: ceramic sculpture , circa 1924 ~ 1926, signed Klee Wyck, 4.4 x 23.2 x 23.5cm,Heffel Auctioneers. catalogue. This is a similarly sized and decorated bowl but the details of the design are more complex and assured, so perhaps it is a later version. This was a piece acquired by Kate Mather the tenant who had suggested that Carr produce pottery. In spite of Carr’s feelings about appropriating the native designs she did exist in a nationalistic art climate that promoted the forests, lakes, mountains, wildlife and indians as subject matter. The Carr name results in prices tht are “fine art” in scale. This particular piece sold for $26,325 CAD in 2011. The similarly themed bowl was estimated to sell for $6000 to $8000 CAD in the same year. The sale prices and estimates are interesting and show a marked difference between prices that are considered art, or by and artist, and craft. Carr. Klee Wyck Frog Bowl: c.1924-26. 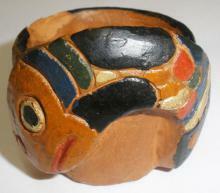 Painted Klee Wyck Frog Bowl. c.1924-26, signed Klee Wyck, 4.4 x 18.7. Heffel Auctioneers. This bowl shows an elaboration of the form of the two dogfish bowls above. Listed as ceramic sculpture, as are the two Dogfish bowls above, is a mid-point between art and craft. Although they are bowl forms they are non-functional, more for display than use.Two small handles are not only attached but cleverly incorporated into the overall design. Her designs tend to be strongly asymmetrical and show that she did in fact have a strong design sense. The forms are themselves flattened out and the colour shapes are flatly painted with even, un-modulated black outlines. The green and blue colours reflect the water them. 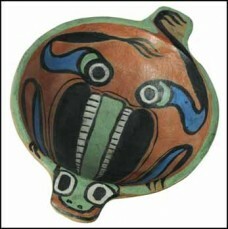 The main “frog” form symmetrically occupies the main part of the bowl interior and with the head overlapping one handle. The tadpole-like legs asymmetrically fill in the rest of the interior and the second handle. The eye-like shapes are arresting in their placement.The bowl sold for $10,040 in the Spring of 2011. Nice site. Would like to get involved with your project at some point. Thank you, Allan. Someone of your reputation is always welcome. Perhaps we can talk more, either by phone or email, to discuss options. I’ll email you in a while to set something up. Debra is one of my favourite people. I have a question… Was there a time when she signed her art with initials??? EMC??? An interesting question. Although Car had a number of signatures on her paintings I have not seen her use EMC on her pottery. If you have a ceramic piece so signed please send me pictures of the full work including one of the signature. Thanks so much, this helped a lot. But what did “KLEE WYCK?” mean? “What does Klee Wyck mean, Mrs. Wynook?” asked the Missionary.